The Kilauea Lighthouse was built in 1913 and sits on a narrow peninsula on the northern most point of the main Hawaiian islands. It is a magnet for nesting seabirds, which include the red-footed boobies, the Laysan albatross, and the great frigate bird with its 8-foot wingspan. On our previous visit to the lighthouse we had seen whales and an assortment of sea birds and found it very fun and… yawn… educational. We arrived at the parking lot, paid our admission fee, and started up the path towards the lighthouse. Along the way we came across a couple of “regular geese”, or so we thought. The Pacific Northwest is overrun with geese. You cannot go to any park or golf course near water without seeing hundreds of geese. So, whenever we do go to a park with geese, Sydney loves to chase them and make them fly away. They are kind of a nuisance, so nobody minds. After all, they poop all over the place and can be rather aggressive. So, the first thing Sydney does upon seeing a “regular goose” was to chase it. A nearby park ranger sees this, frowns, and comments that she should not chase them as they can be rather mean. We ask Sydney to stop and started reading some of the informational signs. It turns out that these “regular geese” are actually called Nene’s, or Hawaiian Geese, and are the State Bird of Hawaii. And, they nearly became extinct and the remaining few are currently on the Federal List of Endangered Species. Oops! Well, at least Sydney can now brag that she chased an endangered species around. Not many can boast that. Further up the trail we started to see fluffy baby seabirds sticking out of small burrows in the ground. According to the informational sign they were Wedge-tailed Shearwaters and almost ready to leave the nest. As we came into view of the lighthouse we were disappointed to see a fence and scaffolding surrounding it. A sign said they were trying to restore it, as it was 97 years old. So much for good lighthouse photos. We were also disappointed that we were a month too early to see the whales. Oh well, at least we got to chase an endangered species and see fluffy baby seabirds. We often enjoy hiking in Oregon’s scenic Columbia River Gorge. This photo was taken along a trail to a waterfall. An amazing place! 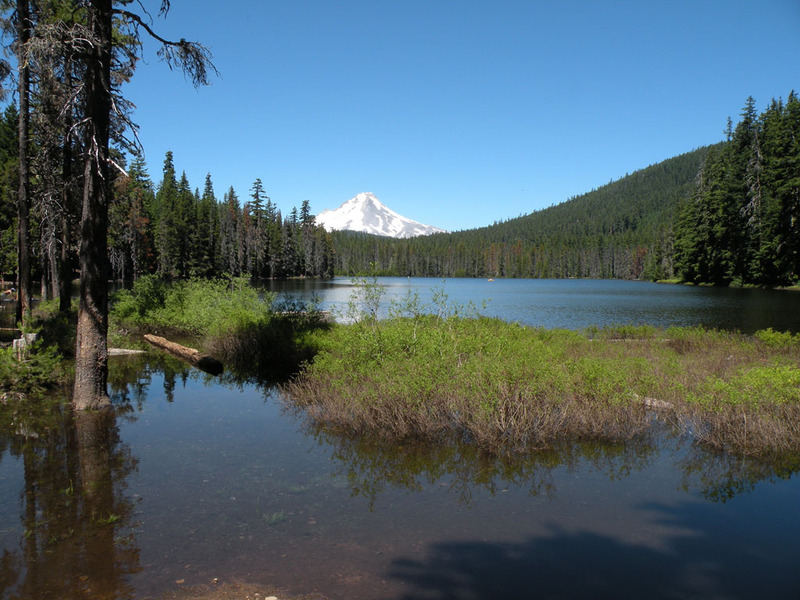 Photo of Frog Lake with Mt. Hood in the distance. There are a lot of tiny frogs there, hence the name. This is a photo Kerri took of me fly fishing at Clear Lake on Mt. Hood. We often enjoy camping there during the summer months.